I will be celebrating all week and you can win prizes from www.motherknowsbest.net. I am giving away 1. plug-in difuser and an essential oil, plus, I have two sons who are amazing artists. I will post pieces of their artwork that I will also give: 2. a color print from both sons. Those are 3 prizes I have lined up. To win one of the prizes this week you can be entered in the drawing by. 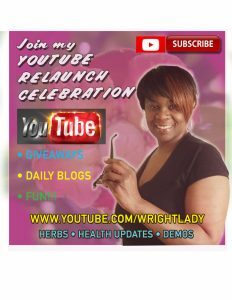 Subscribe to my YouTube www.youtube.com/wrightlady. Leave a comment on one of my YouTube videos. Let me know other topics you want to see or any comment you want to share. Do all 4 steps and you will be entered in the drawing to win the prizes mentioned above!!! Have a FANTASTIC Week!!! I will be blogging daily to celebrate the RELAUCH of my YouTube!! !